The Hercules Cluster of Galaxies contains about 200 member galaxies with a wide range of mostly spiral galaxies, a smaller number of elliptical galaxies, and a healthy collection of colliding galaxies. This image shows well the contrasting colors of younger star forming galaxies which are primarily blue, while older galaxies are mostly yellow. This is a tighter crop of the full frame version. In this photo, North is Up. This image is cropped to 51% of the original full frame. Software Used Images Plus 5.0 for camera control, IP 5.5 Beta for calibration, stacking, digital development, star shrinking and halo reduction, smoothing and noise reduction, and multiresolution sharpening. Photoshop CS5 used for levels and curves, equalize, star shrinking, screen mask invert, lab color, saturation adjustments, selective color, match color, lens correction and color channel alignment. Gradient Xterminator for gradient removal. Carboni Tools for additional noise reduction, and smoothing. HLVG for additional color correction. Registar for aligning stacks. Straton for star removal. Focus Magic for focus restoration. Notes This was a very fun image to process as the multitude and variety of galaxies is astounding. 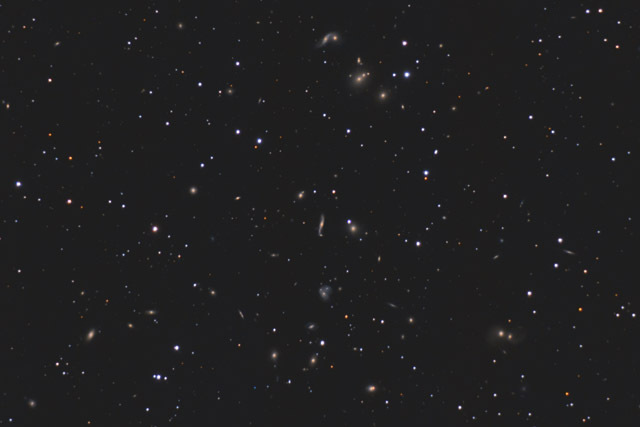 This image won Astrophotogallery.org's Hard-Galaxy category for June 2013. This image also won 1st place in Cloudy Night's June 2013 DSLR Challenge contest. And, this image was published by Astronomy Magazine as its Picture of the Day for December 5, 2013!